I’m starting to miss coloured pencil, though. I still want my digital layers, but I’d like a bit of colour in the traditional work my digital pieces start with. 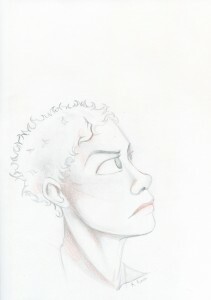 Hence a (very tiny) bit of colour experimentation before even the first scan. I blame Daily Paintworks for this, my traditional artwork feels dull compared to all those bright paintings.